This morning’s edition of PR Week – which, ironically, is a daily — brought the news that GE has launched the GE Artistry Series — a line of kitchen appliances designed to appeal to Millennials. How, I wondered, would one design a stove to make it more appealing to the 25-year-old home chef de cuisine? Perhaps it shops, cooks and cleans up by itself? Okay, this is too easy, like shooting fish in a barrel. I give GE credit for trying to capture a portion of this huge new home buying demographic, but its marketing assumptions may not be entirely valid. I work with Millennials — a lot of them. In the US, we hire 5,000 college graduates every year. And I can tell you that, while many of them may have some broad characteristics in common, Millennials are as multifaceted and individual as members of any other generation. There is no monolithic Millennial archetype, any more than there is one monolithic Baby Boomer archetype. I should think most Millennials would be offended to be profiled as so predictable that they will stampede to the nearest Sears in a frenzy of refrigerator lust. Of course, all generations are targeted in one way or another. Millennials, here’s a taste of what’s coming your way someday. I was born smack in the middle of the Baby Boom. Based on the commercials that run on the evening news, it is assumed that I am impotent, incontinent, and a little incoherent. Crippled with arthritis, when I fall I can’t get up. A big date is taking a bath with my wife. In separate tubs. On a hilltop. I do find these commercials a little insulting and I am sorry to see the same tactics being applied to my Millennial acquaintances. According to PR Week, GE is hoping that the retro styling and low prices of the new line will appeal to Millennials, but I think there are just as many people among the Baby Boomers and Generation X-ers who like retro styling and low prices, too. Especially the Boomers building homes for future fixed-income-living retirement. I am also willing to bet that there are a lot of Millennials who like sleek, stainless steel appliances with internet connections. And a lot who are getting tired of being referred to simply as Millennials. Anyway, the real magic in the kitchen came from the imposing Mixmaster that occupied an outsized portion of counter space. 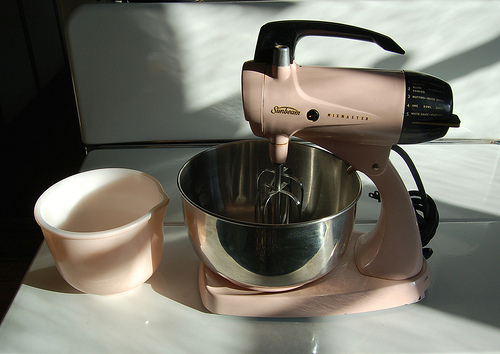 The Mixmaster was my mother’s domain. And as far as my sister and I were concerned, its sole purpose was to provide us with beaters to lick. Whether it was cake frosting or chocolate pudding (from scratch! ), we’d wait impatiently for the mixer to do its job. 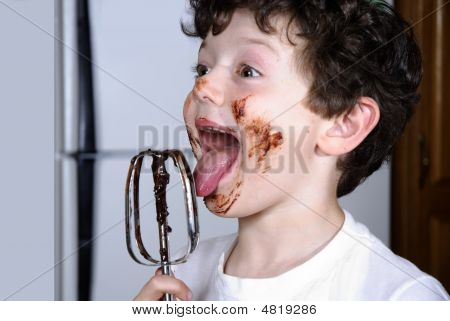 When Mom extracted the beaters we would begin the complicated and delicate task of working our tongues up, down, and in between the beater blades in pursuit of the last molecule of chocolate goo. It wasn’t pretty, but it sure was fun. Loved this-especially the memory of licking the beaters! Another BabyBoomer trait that millennials can surpass — learning numbers. Prudential had to hire a Harvard social psychologist to ask people how old is the oldest person they know. To answer you get a round blue sticker to place on a board out in some meadow.. One hopes GE is not relying on Prof. Dan Gilbert’s statistic-gathering acumen to guide their millennial strategy.